#25 Fr DB Ryan Coccaidiferro from (Dumont, NJ / Dumont) recovers a DelVal fumble. DOYLESTOWN, Pa. – Winning field position for most of the game, the Lycoming College football team was able to take a lead into the fourth quarter, but 17th-ranked Delaware Valley University scored twice in the fourth quarter to post a 23-16 Middle Atlantic Conference win on Saturday, Oct. 13, at James Work Memorial Stadium. The Warriors (3-3 overall, 2-2 MAC) were led by freshman Elijah Shemory (Jersey Shore, Pa./Jersey Shore), who completed 14-of-26 for 185 yards and he also rushed for a touchdown. Senior Brock Zollicoffer (Owings Mills, Md./Owings Mills) caught three passes for 66 yards and senior Nick Costello (Havertown, Pa./Haverford) added three catches for 57 yards. With the game tied at 16 in the fourth quarter, the Warriors got to the Delaware Valley 40 before a drive stalled and senior Connor Bell (Mickleton, N.J./Kingsway Regional) booted a punt into the end zone. Delaware Valley (6-1 overall, 4-0 MAC) gained two first downs and on a broken play, Dashawn Darden found John Davis for a 32-yard touchdown with 6:39 left. #22 Sr DB Joe Pinzka (Perkasie, Pa./Lansdale Catholic) led the Warriors with nine tackles. The Warriors again crossed midfield in response, but their drive stalled at the 46 and the Aggies were able to run off the remaining time on the clock to stave off the upset. 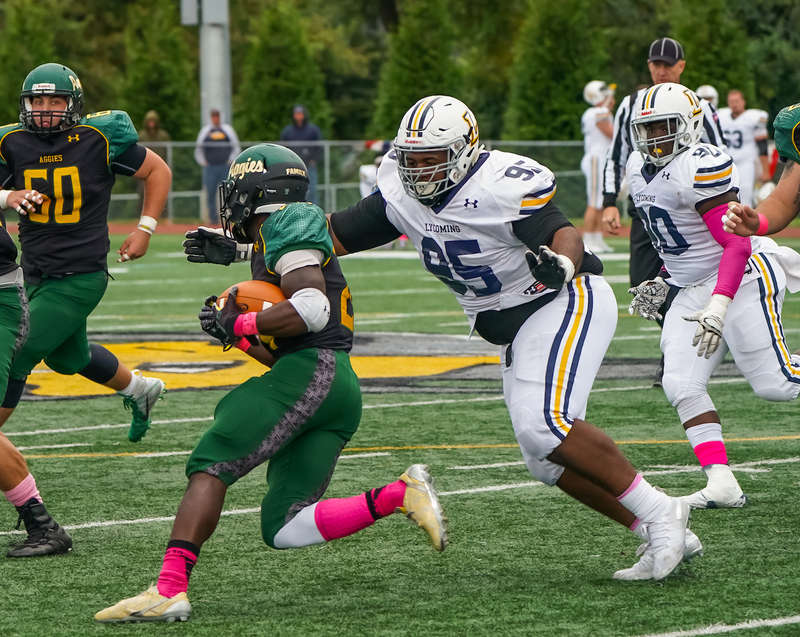 After Delaware Valley opened the game with a field goal and touchdown on its first two drives, the Lycoming offense got started with its second drive. Aided by a personal foul penalty that put the ball at the Lycoming 41, Shemory found Zollicoffer for a 21-yard game on the opening play of the drive and then on 3-and-20, Shemory found Zollicoffer for a 38-yard gain on the sideline that drove the ball to the 12-yard line. Faced with another 3-and-long, Shemory found junior Jacob Fimbres (La Habra, Calif./Sonora) for a nine-yard game and two plays later, Shemory snuck across the goalline for his fourth rushing touchdown of the season. #95 Jr DL Ahmad Curtis (Effort, Pa./Pleasant Valley) had six stops and a tackle for loss. Lycoming came back with a penalty-aided 30-yard drive on its next possession, with junior Keith Batkowski (Montoursville, Pa./Montoursville) diving in from a yard out after the Aggies committed a facemask penalty on 4-and-goal from the one-yard line, as Lycoming took a 13-9 lead. 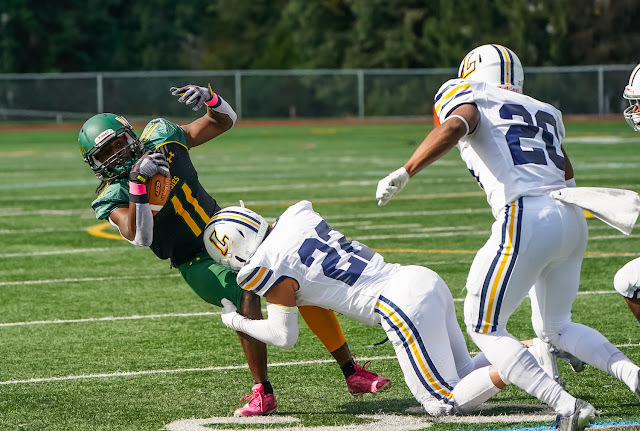 After that, neither team would get into position to score again until a swarm of Warrior defenders forced Darshawn Darden to fumble the ball at the 14-yard line, with freshman Ryan Cocciadiferro (Dumont, N.J./Dumont) falling on the ball. Three plays later, junior Jamie Fisher (Folsom, Pa./Ridley) connected on a 42-yard field goal, hit third 40-yarder of the season. The Aggies tied the game early in the fourth quarter, driving 75 yards on 12 plays before Juwan Manigo dove for the left pylon to cap a 13-yard reception to make it 16-16 with 12:12 left. Senior Joe Pinzka (Perkasie, Pa./Lansdale Catholic) led the Warriors with nine tackles and Cocciadiferro added a career-best seven. Both junior Jeff Coplin (Philadelphia, Pa./Central) and Ahmad Curtis (Effort, Pa./Pleasant Valley) had six stops and a tackle for loss, while Coplin also had two breakups. Darden finished 18-of-30 for 181 yards and two touchdowns passing and he ran 21 times for 104 yards. Shaveiz Stewart led the Aggies with eight catches for 53 yards and Quadir Strothers rushed six times for 72 yards and a score. Michael Nobile had seven tackles, four for loss and two sacks to lead the defense. 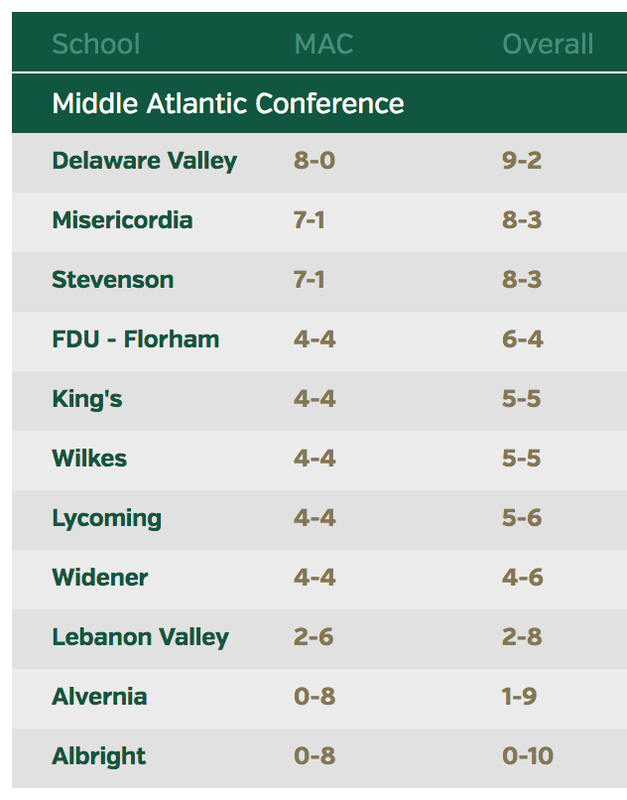 The Warriors get back on the field on Saturday, Oct. 20, when they host Alvernia University on Homecoming at 1 p.m. in another Middle Atlantic Conference game.